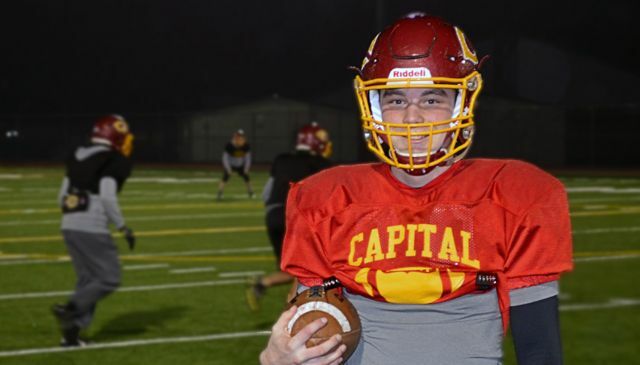 Cody Jenkins watched from the sidelines, still feeling the painful effects of the strange accident which resulted in his right index finger receiving 15 stitches, as Capital High School opened its 2015 season with a lopsided 42-9 loss to Tumwater. Hopes had been high during the summer. A strong senior class, with quarterback Jenkins leading the charge, was supposed to contend for one of the 3A Narrows League’s top playoff slots – maybe even challenge heavy-favorite Lincoln for the league crown. But here it was week No. 1 and Jenkins was reduced to a spectator. Making matters worse was the fact that Jenkins’ injury was not football related. It didn’t happened during a game nor was it the end result of some overzealous scout team member who failed to remember the starting QB is not to be touched during practice. A freak accident, unrelated to football, caused Capital High School’s starting quarterback, Cody Jenkins, to miss the first six games of the season. No, Jenkins missed his senior season opener due to a pesky moth. The moth escaped unscathed. Jenkins wasn’t so fortunate. A quick trip to the emergency room and Jenkins was all sewn up, but the injury, which occurred on his throwing hand, would prevent him from playing quarterback for the first six games of the season. By that time Capital had limped to a 1-5 start. The playoffs looked bleak at best. But if one thing sticks out about head coach John Johnson’s tenure with the Cougars is that no season is unsalvageable. The Cougars could turn to a number of recent seasons for inspiration. In 2008, Capital started 0-2 and were 3-3 before rallying down the stretch and advancing to the Class 3A state semifinals. A similar 0-2 start happened the following season before the Cougars advance to the state playoffs. 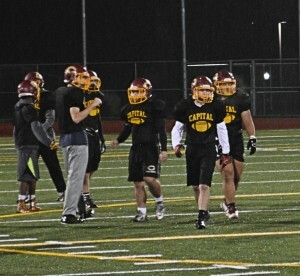 The most recent example occurred in 2011 when the team start 0-3 and ended with an appearance in the state quarterfinals where it took eventual state runner-up O’Dea three overtimes to end Capital’s season. Now healthy, the Capital High School football team is looking at post-season play. This year’s Capital squad could add to that history. The Cougars will take a three-game winning streak into a state play-in game on November 6 against 3A Greater Saint Helens League champion Columbia River. The winner of that contest will advance to the state playoffs as the top seed out of District 4, meaning Capital, rough start and all, could potentially be hosting a first-round state playoff game. The Cougars opened their playoff surge in a 37-18 victory over Mount Tahoma in a game where Jenkins finally got the start at quarterback. He proceeded to toss a pair of touchdown passes to Zach Smith. Up next was a showdown against North Thurston, a team squarely in the playoff hunt. 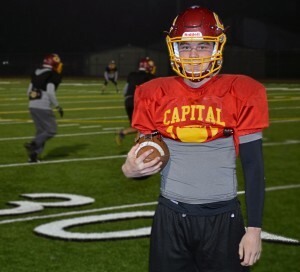 Jenkins threw five touchdown passes, four in the first quarter, as Capital thumped the Rams, 49-7, to put a dash to North Thurston’s postseason hopes. Then came the eye-opening 31-0 win over Shelton, which was looking to wrap up the league’s second seed with a victory. The Cougars have certainly done that and are now just one win away from another state playoff berth.